An epistolary novel is uncommon in the present day, but it is the perfect vehicle for telling a tear-jerker of a story of love, loss, war, and change. No one who reads the first chapter will be able to put this novel down until the last page is read. 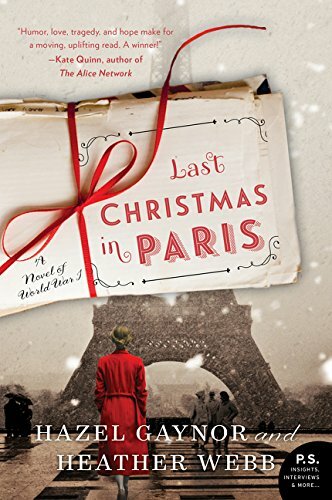 In the first bloom of patriotism and total innocence, Evie plans for Christmas in Paris with Will, Tom, Will’s friend, Alice, and herself. The war will be over and the four can celebrate victory over the Germans. If luck is with her, then the young man her mother is planning for Evie to marry will find a beautiful French girl instead. Those are the concerns of the three protagonists as Tom and Will are shipped to the Front: boys go to war, and girls are still expected to marry well. To Evie’s mother and father, the war will not change the existing social structure. To Tom and Will the war, while it may be rather unpleasant and there will inevitably be a few casualties, the whole experience will be an exciting adventure, and they will return heroes. Evie considers taking up cycling to pass the time, but tells Tom that her mother will never speak to her again if she takes to wearing trousers. Included in this light-hearted letter is the first hint that the war is impacting the home front. The Army is requisitioning all horses not lame. Evie’s mother’s answer to this is to organize a fundraiser for a Fund for Sick and Wounded Horses at the Front. Evie wants to help the war effort by volunteering to work as a clerk in the War Office or to deliver the post. So many men have gone to war that there are shortages in the work force. Mrs. Elliott is appalled by the whole idea. To Evie’s mother, nothing has changed except that the men are off doing their duty, but will be home soon, and all will return to how it was. Tom’s letters become more revealing as he tells Evie about the muddy trenches and never having dry feet. He tells her of being expected to kill men when he smell their breakfast cooking and hear some of the German soldiers crying just a few yards away. The situation at Tom’s family newspaper becomes more worrisome. His father is ill, and the editor, Charles Abshire, is running the paper. Tom’s cousin, John, whom both Tom and his father dislike, is brought in to run the newspaper. There is no choice. Someone must have authority to make decisions after Tom’s father dies. By February, 1915, word is coming to England from the men at the Front about the plague of rats, the mud, the misery, and disease in the trenches, although the newspapers still speak of victories and brave soldiers. With the death of Evie’s brother Will, the full horror of war is felt. Evie’s mother retreats into depression. Both Tom and Evie now know that life as they knew it will not return. The world has changed, and England will never be the same again, nor will they. Gaynor and Webb have written an amazing historical novel, revealing the horrors of WWI through the letters exchanged by Tom and Evie. The gradual reality of loss, the realization of love, and the confrontation of change is beautifully rendered. Kudos to the authors for such a marvelous story.